Any cook presented with some limes, fish sauce, peanuts and rice noodles could be well on the way to creating a decent Thai meal. But good Thai cooking is complex and not all Thai green curries are created equal, says David Thompson, the Australian chef behind Nahm restaurant in Bangkok and founder of Sailors Thai in Sydney, who calls Thailand home. The chef says there are five key rules all cooks should know before they get out the wok or a jar of pad thai sauce. This means using freshly squeezed lime and proper Thai basil, which is available in good Asian grocers. The chef recommends “the awfully named” brand Megachef for fish sauce. “It's fantastic and I use it all the time in Thailand”. But not every dish needs to have each of these elements. One can be sour, another salty or spicy or creamy. “Balance is achieved by seasoning but also the choices of dishes on the table. You would never have repetition in a meal, you would never have five curries for example. Thompson says any serious cook hoping to crack Thai cuisine needs to invest in a “Jurassic-sized mortar and pestle”. A large, granite mortar and pestle is cheaper than its marble counterpart and is one of the most important items in the Thai kitchen. “They are versatile and can accommodate everything, from making curry pastes and relishes to grinding spices and milling roasted rice. He shuns the food processor for such tasks. Also, he says, if you make a curry paste in a food processor you have to add water for it to bind, which dilutes the flavour and means that when you fry it, you boil the ingredients instead of frying. The chef's arguments for a mortar and pestle might suggest he'd be against bought curry pastes, which he is. “No, no, no, no, no, is the most immediate answer.” Although he does understand the need for convenience. His final advice for aspiring Thai cooks is to make pastes and even coconut cream, from scratch. “But I say that with the luxury of having 20 or 30 chefs working with me, who do that for me. He says the cook can make a larger batch of paste, chill it down and either suction pack it or store it in an airtight container in the fridge for a few days. If you're prepared to make your own curry paste, Thompson says, “you're a bit of a Thai food devotee”. Funnily enough, Thompson hopes to bring out a range of preservative-free curry pastes in the next year, saying he understands the need for convenience. 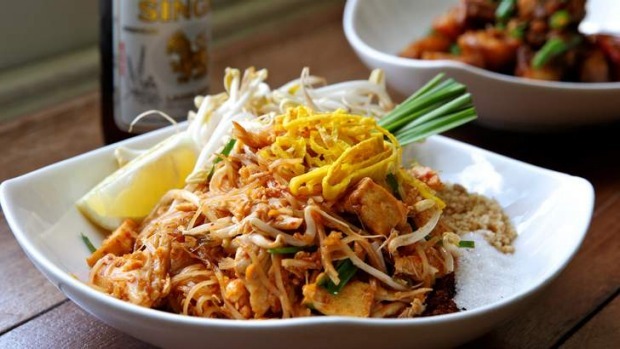 What's your go-to Thai dish? Is there a cooking secret that's essential to a successful dish? Jump on the comments and share your tips.